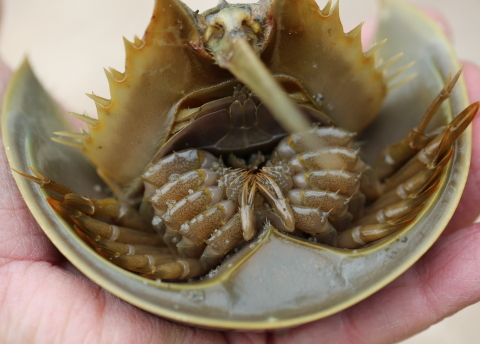 Admittedly, the horseshoe crabs we discovered this morning were a bit sluggish in today’s chilly water temperatures, under cloudy skies and with a stiff northeast ocean breeze. Today’s specimens ranged in weight from a little over 1/2 ounce (17 grams) to 4 1/3 ounces (122 grams). 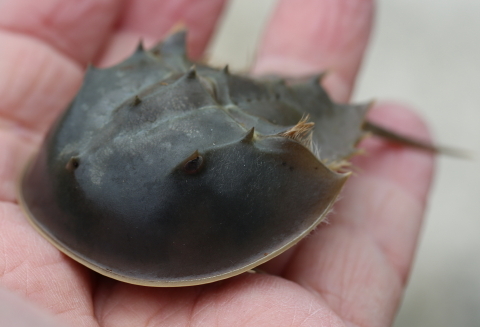 The horseshoe crab’s exoskeleton (shell) does not expand. 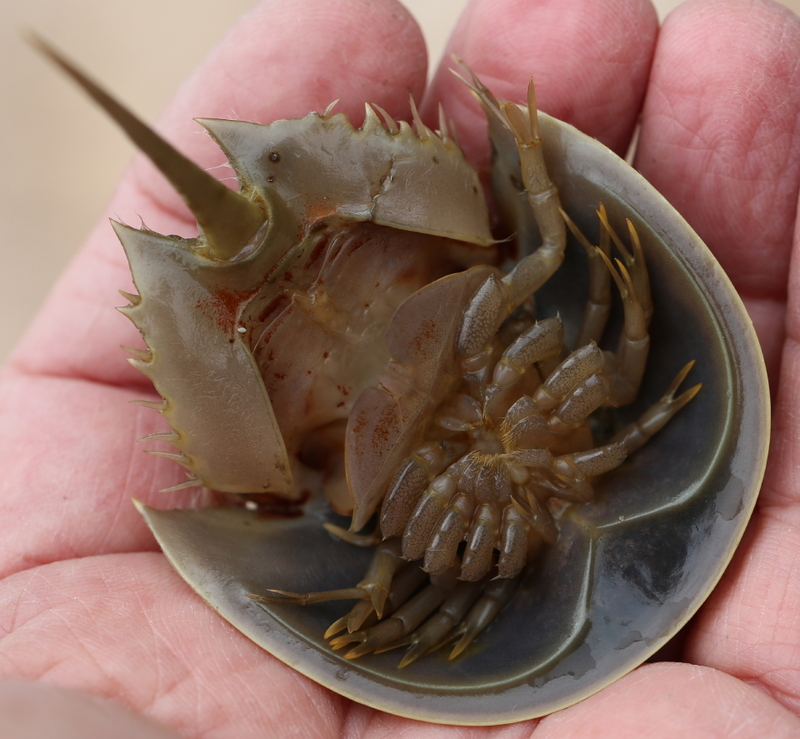 To grow, horseshoe crabs molt, as many as five times in the first year, three in the second, two in the third, and once a year thereafter until maturity is achieved. 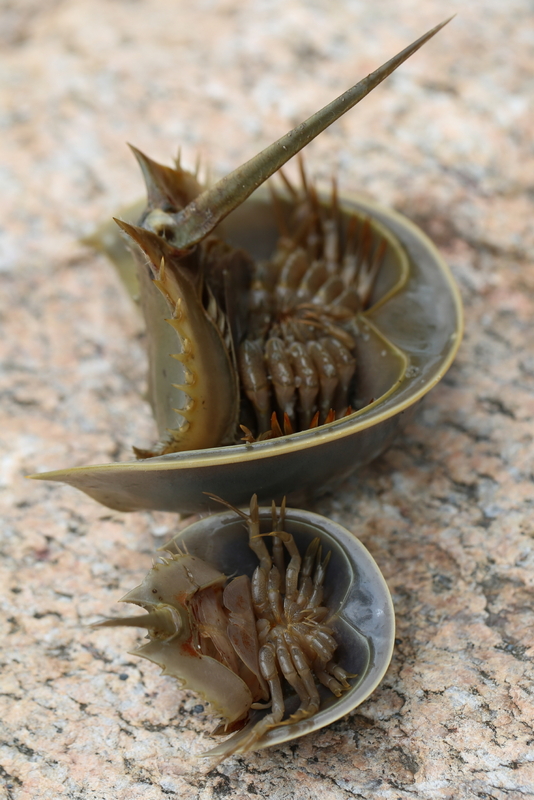 It takes sixteen and seventeen molts respectively over a period of nine to eleven years for a male and female horseshoe crab to reach maturity. 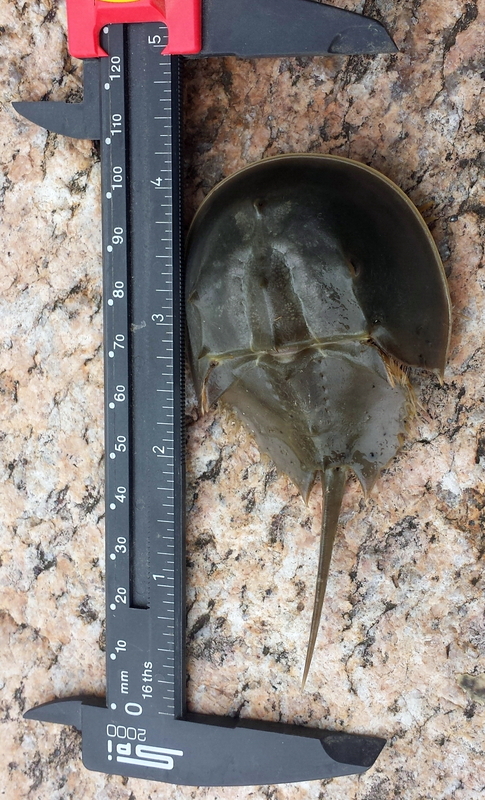 The tiniest horseshoe crab measured less than 2 1/4 inches (~ 6 centimeters) long (minus its tail/telson). 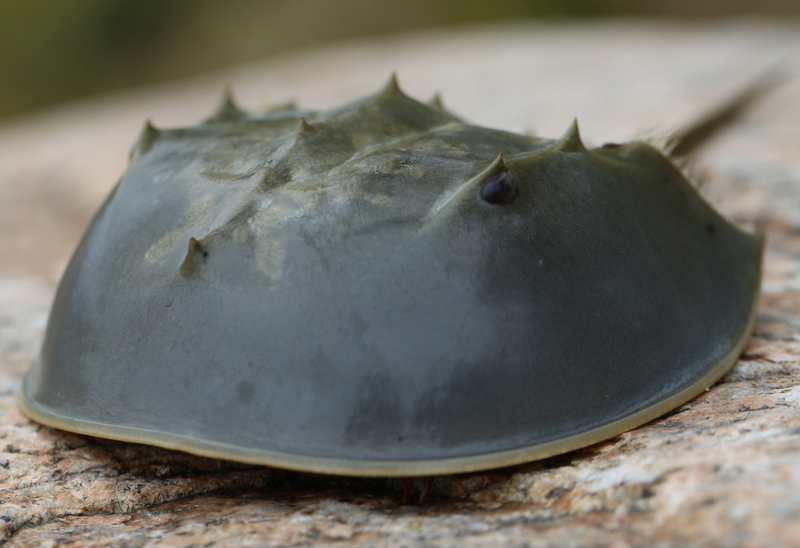 As you may know, horseshoe crabs are the true “blue bloods” of the animal kingdom with blood composed of copper rather than iron. This limulus blood yields a unique and powerful gram-negative bacterial detector that saves human lives. Horseshoe crabs have also been extremely valuable in the research of vision with both compound and simple eyes, as well as facilitating many other scientific and medical breakthroughs. The largest juvenile horseshoe crab we encountered this morning measured about three times the length of the smallest and hit the scales at 4 1/3 ounces. 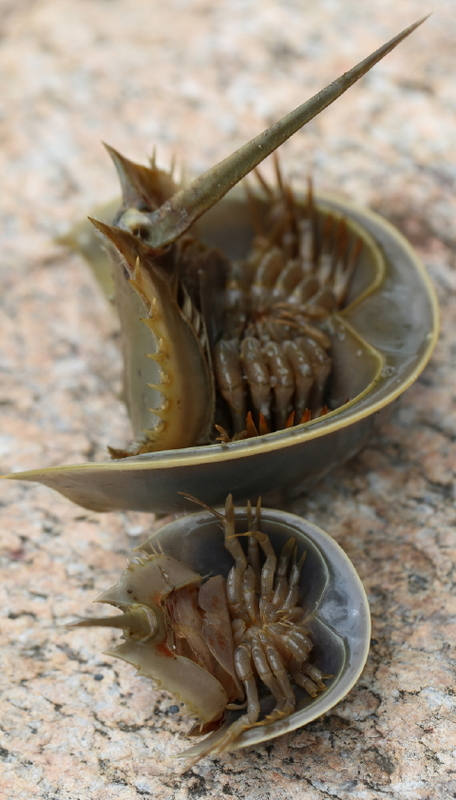 The ventral (bottom) view of this juvenile horseshoe crab clearly shows the five walking legs on each side, the forward feeding pincers (Chelicerae), and the rear book gills. The telson (tail spine) is pointed directly at the camera. 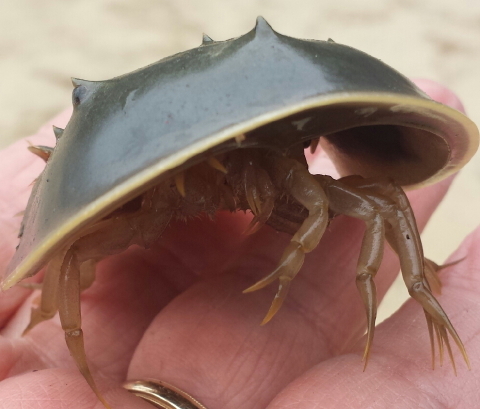 Juvenile horseshoe crabs are delightful to watch as they plow through the sandy bottom of creek channels. As adults, horseshoe crabs are Nature’s auto-tillers, constantly refreshing coastal tidal and inter-tidal flats. Appearing as ancient as the earliest trilobites, horseshoe crabs stir awe in the Turtle Journal team. Sadly, humans have harvested these valuable critters to the edge of extinction, extirpating them from one estuary after another, impoverishing our entire tidal and inter-tidal eco-systems, and driving shorebirds that survive epic migrations on nourishing horseshoe crab eggs to the brink, as well. 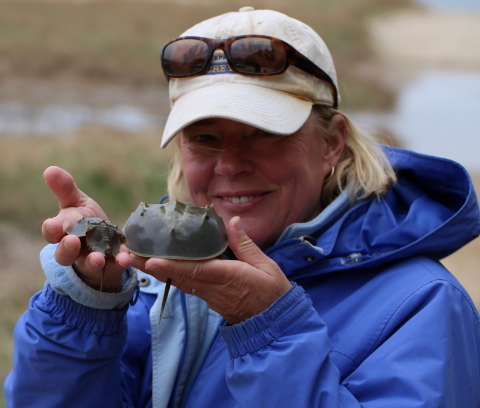 So, it is especially joyful each spring to find juvenile horseshoe crabs as we continue to hope for sanity to prevail among state and federal wildlife managers of this important foundational marine species. On Saturday, April 26th, the Buzzards Bay Action Committee (BBAC) held an Earth Day event at the Fairhaven Senior Center on Huttleson Avenue (Route 6) in Fairhaven, Massachusetts. Environmental, conservation and environmental groups from throughout all SouthCoast communities staffed tables packed with actionable information. BBAC invited the Turtle Journal team to join the six hour event, and as illustrated by the photograph above, turtles “spotlighted” the day’s activities; spotted turtles, of course. This spring has been especially chilly. 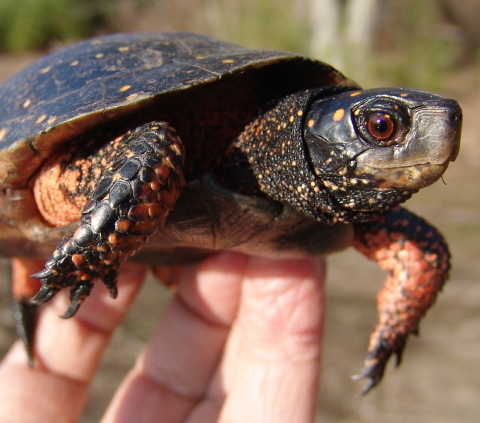 With the exception of just a handful of diamondback terrapins, snapping turtles and painted turtles, only spotted turtles have been active in the wetlands of the SouthCoast. We are very fortunate to have such gorgeous little reptiles as our earliest harbingers of spring. 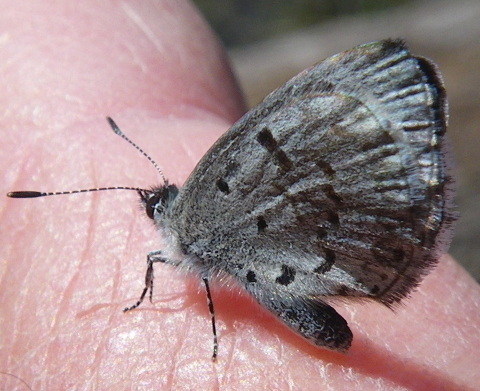 It’s amazing they appear so small and delicate, yet are so hardy in the harsh spring climate. 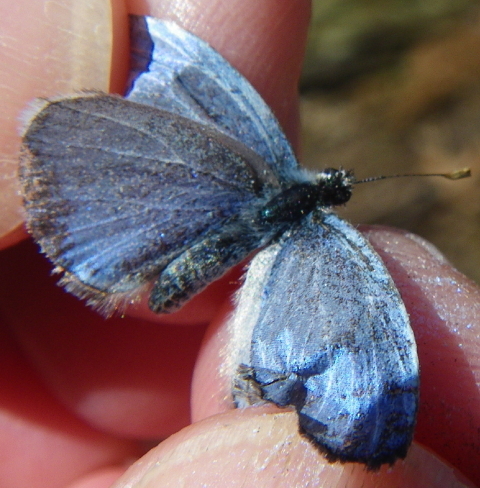 We recently discovered this couple above at the Goldwitz Bog in a mating aggregation that has been severely degraded by debris dumped into bog channels over the last year ironically in a federally funded project to “improve” wildlife habitat. After spending the day meeting SouthCoast families and advocating for real wildlife habitat conservation, these handsome spotted turtles, like the adult male pictured above, headed back into wetlands mating aggregations to do their important part to advance the survival of SouthCoast turtles. Temperatures dipped below freezing on Easter morning on the SouthCoast of Massachusetts. 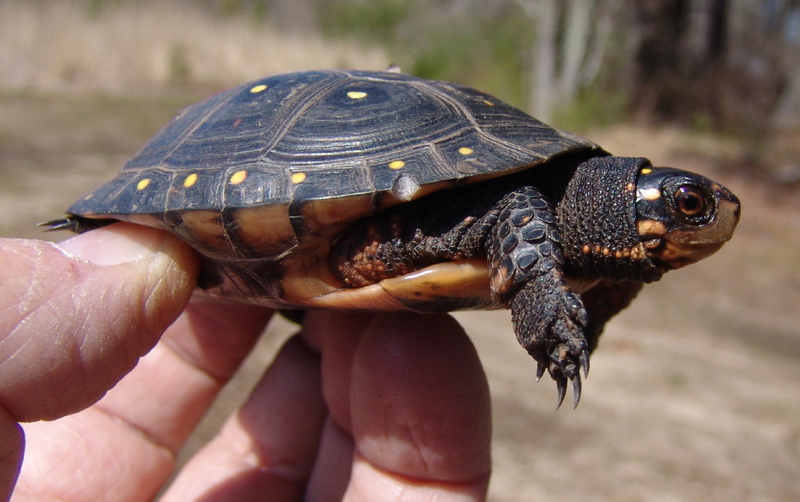 Cold brought quiet to spring activity in local wetlands with a single, lazing garter snake and a pair of spotted turtles our only observations in protected Goldwitz Bog. 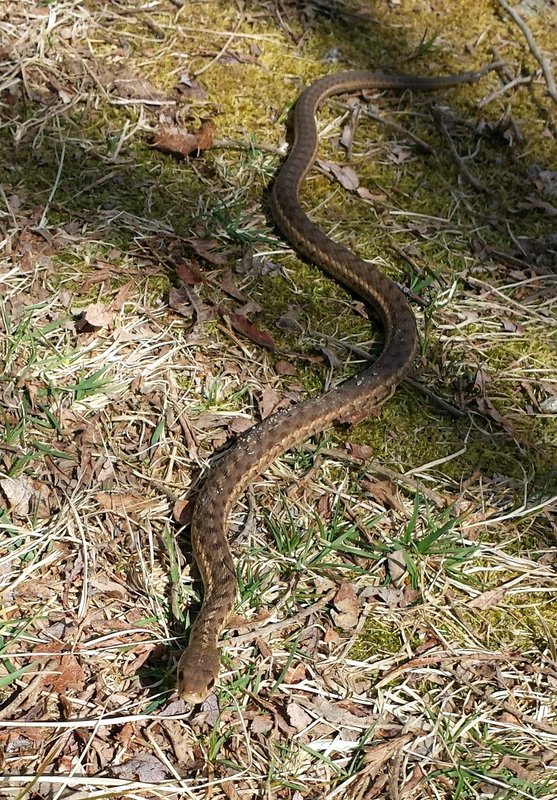 The young garter snake had sprawled out on the sunny pathway at the abandoned Goldwitz bog and seemed unamused when Turtle Journal’s Don Lewis pulled out his smart phone to snap a few closeups. 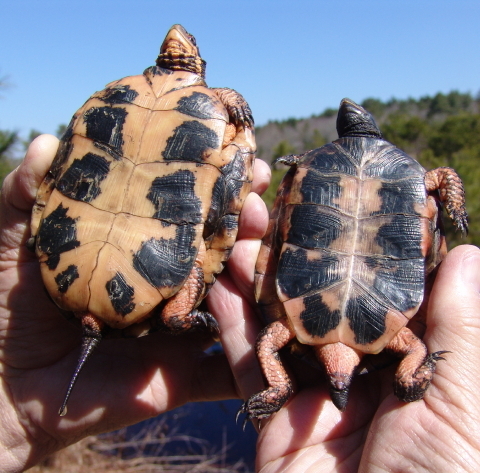 Turtle Journal’s Sue Wieber Nourse found female Spotted Turtle #53 (on the left) relaxing with male Spotted Turtle #118 (on the right). Pictured above, they represent perfect gender types: she with her colorful neck and thin tail; he with his drab neck and thick tail. Male #118 also exhibits concavity across his plastron’s abdominal scutes, while Female #53 shows off her flat, washboard abs. They, too, were found in a degraded mating aggregation at Goldwitz bog. About a mile away the Turtle Journal team explored the Grassi Bog around noon on Easter as temperatures climbed into the mid-50s. At this wetlands we discovered spotted turtles in full mating glory. Seen above is male Spotted Turtle #120. He hit the scales at 188 grams (6.6 ounces) and his carapace (top shell) measured 11.43 centimeters (4.5 inches). For our spotted turtles, he’s a very big boy! 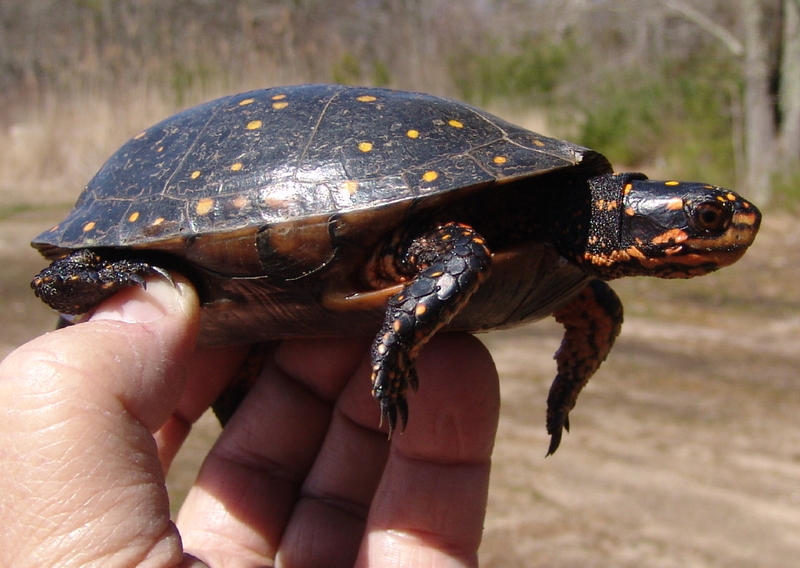 We also netted female Spotted Turtle #121, an 11-year-old that weighed 185 grams (6.5 ounces). 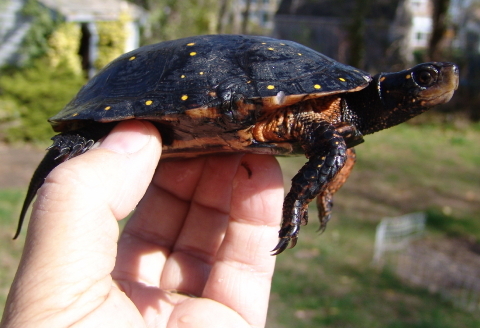 Her shell length measured 10.56 centimeters (4.2 inches). 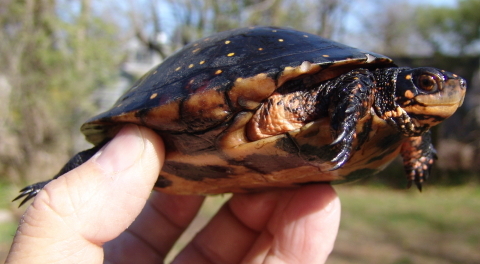 Female Spotted Turtle #122 is only nine years old. She weighed 115 grams (4.1 ounces) and measured 9.61 centimeters (3.8 inches). The real sweetheart of the bunch is young Spotted Turtle #123, a five year old female. She only registered 64 grams (2.3 ounces). Her carapace (top shell) measured a mere 7.18 centimeters (2.8 inches). 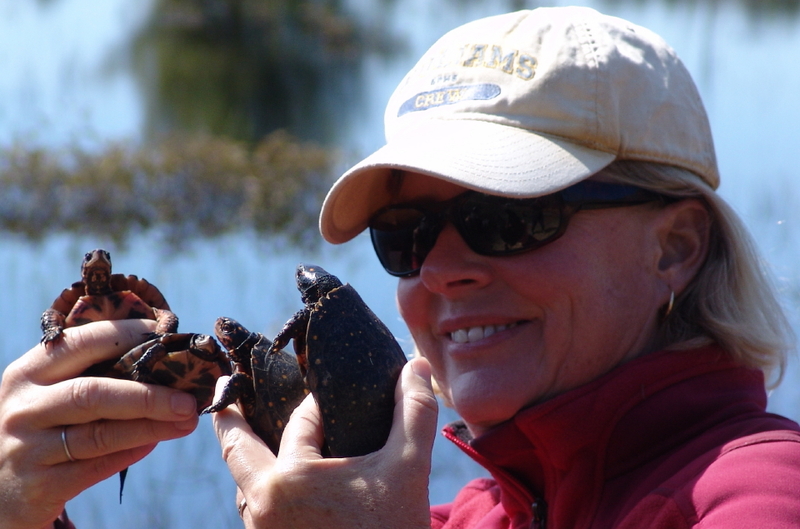 After we examined the turtles and took scientific measurements, Sue Wieber Nourse released the spotted turtles back into Grassi Bog. 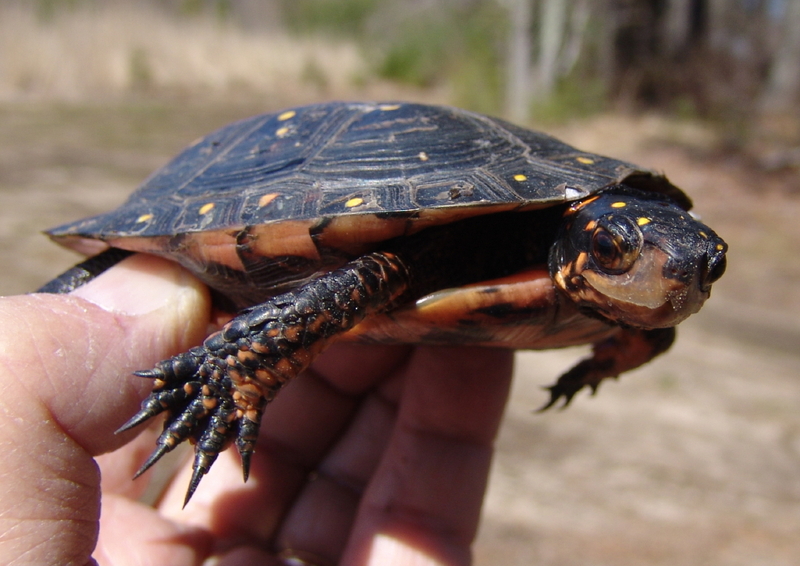 The Turtle Journal team also found a juvenile (2-year-old) painted turtle basking in some brambles at Grassi Bog. 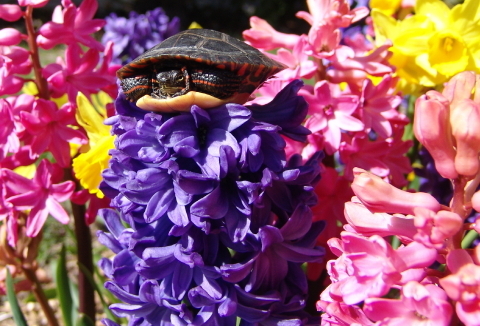 No Easter bouquet could be complete without a baby painted turtle to add a dash of color to the day. With the recent cold snap, aquatic and marine turtles have returned to slumber (brumation). 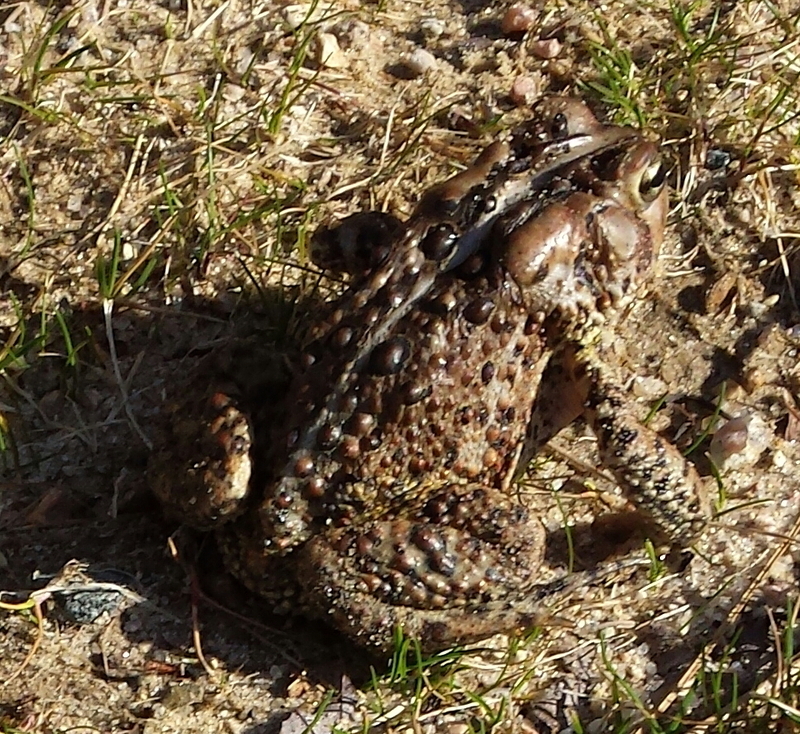 Wetland frogs that had been in riotous clamor have become quiet. So, we were surprised yesterday when we discovered this American toad in a local bog. Rufus (the Turtle Dog) found the toad. She sniffed out the critter hiding in a clump of grass, and pointed her nose at the toad until she caught our attention. Rufus is quite the research assistant. 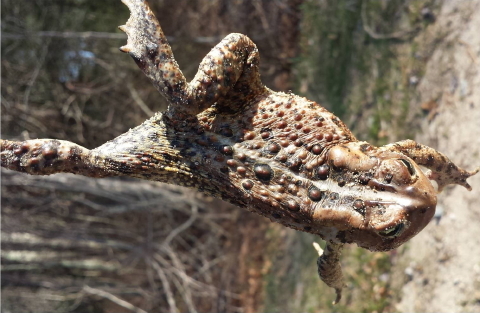 The American toad (Bofu [Anaxyrus] americanus) is one of the more frequently seen amphibians whose habitat ranges throughout the eastern United States and Canada. They are sometimes called a “hop toad” and can reach a length of more than 4 inches. Adults are generally plump. 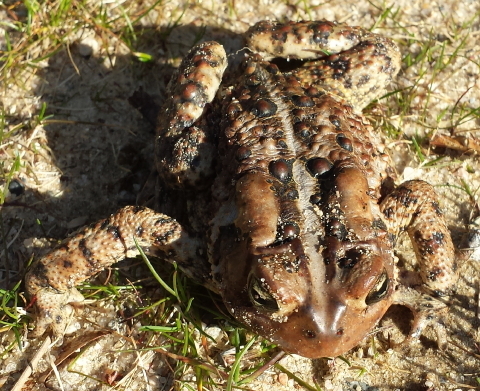 The American toad has a beautiful trilling call as illustrated in the YouTube video above. As described on the U.R.I. web site, the American toad has a large, wide head, short limbs and rough, warty skin. 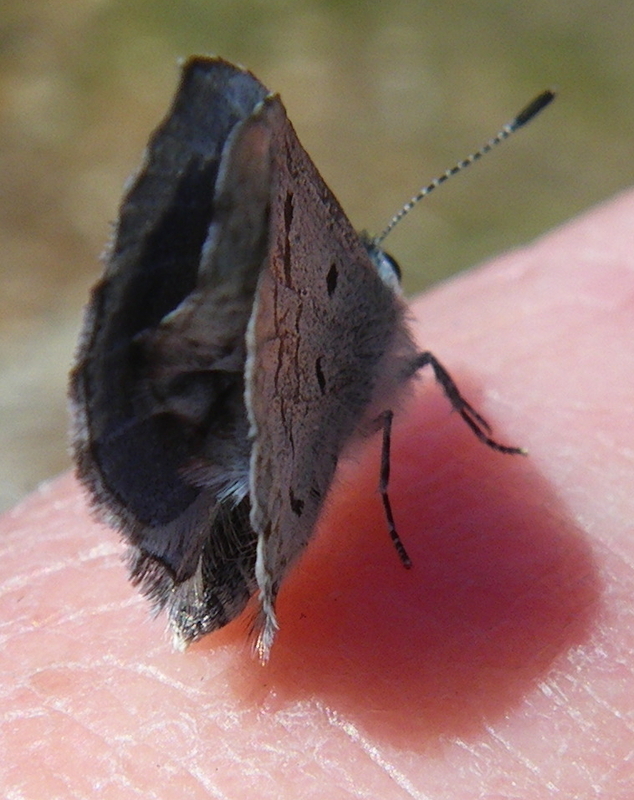 A light, narrow mid-dorsal stripe may be present, as illustrated in this photograph. 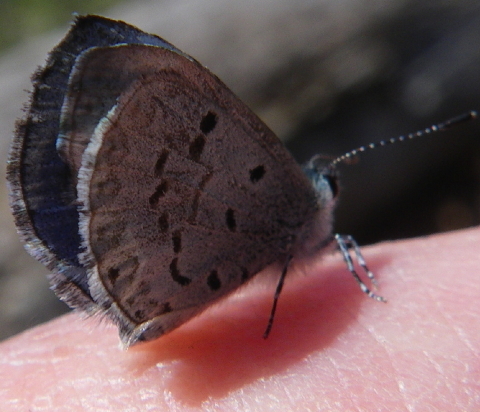 The ventral side is cream colored with small dark spots. 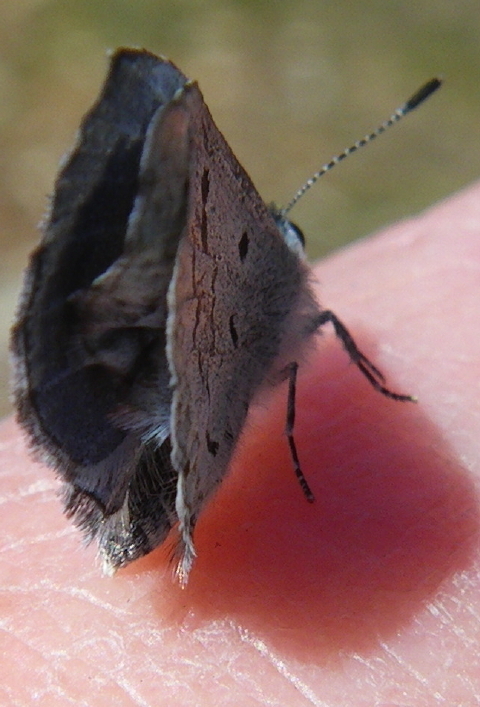 Males have dark throats and females are significantly larger than males. 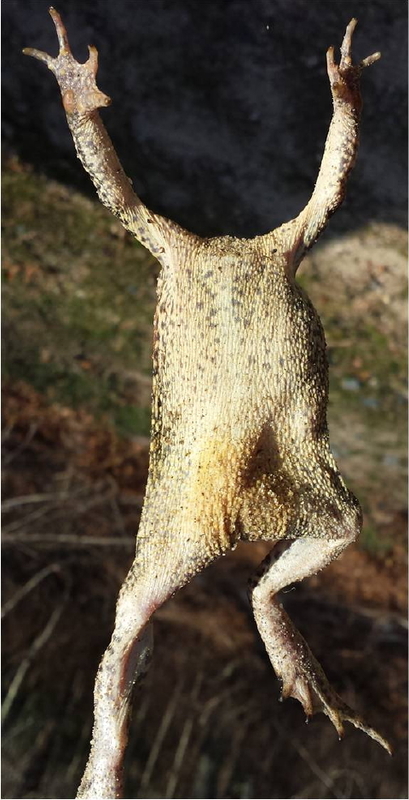 Both factors indicate that this specimen is a female American toad. You are currently browsing the Turtle Journal blog archives for April, 2014.